Bring a large pot of water to a boil. Add lots of salt, then pasta. Stir well. While the pasta is cooking, fry the bacon in a large skillet over medium heat until done. 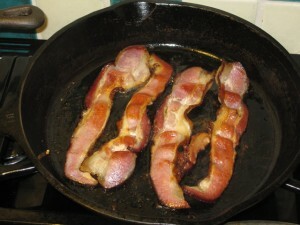 Remove the bacon from the pan, reserving the hot fat in the skillet. Chop the bacon and stand by. As soon as the pasta is almost al dente, drain it well and add it to the skillet along with the bacon. Toss well and cook for another minute or two, so that the grease really cooks into the macaroni. Season with salt and plenty of black pepper to taste. Serve immediately in hot bowls. “Enh,” Meg wrote me a day or so after she’d sent the original recipe (the word means “yes” in Ojibway). “Try the mac and grease with a few big garden tomatoes cut into 1-inch cubes.” It’s incredibly simple—just chunks of really good tomato tossed into the hot bacon fat for a minute or two with some salt before the pasta goes into the skillet. “The tomatoes,” she said, should “get hot but not saucy, if you know what I mean. I did, and I made the dish and it was, again, in its simplicity, really, really good. Of course it’s only worth doing when the tomatoes are in season. The rest of the year you could gussy up your Mac and Grease by tossing in chopped vegetables or greens of most any sort, and cooking until they’re somewhere between soft and golden brown. Thinking more exotically, I want to throw chopped hickory nuts on top, too. You, of course, can do whatever you like. Like most pasta dishes, this one lends itself to hundreds of variations. From the book that started it all, Zingerman’s Guide to Better Bacon, we bring you the 10th Annual Camp Bacon! To celebrate, we’ll be sharing recipes from the book with you. Come see us at Camp and learn more. We hope to see you there! A great all-American dish dating back to the Colonial era, wilted salad uses bacon fat as the basis for a dressing in much the same way that olive oil is used to dress greens in the Mediterranean. The heat of the bacon dressing wilts the greens—hence the name. April McGreger, who grew up with bacon fat as the basis for a lot of her family’s food, told me that they called this “killt lettuce”—because the lettuce is “slain” by the hot fat, not because of any connection to Scottish menswear. The bacon’s flavor is a big part of the dish, so use whatever variety strikes your fancy. Because the fat will solidify once it cools, the dressing must be served warm. Place the greens in a large, heat-proof serving bowl. Fry the bacon in a heavy-bottomed skillet over medium heat until crisp. Remove from the skillet, drain and chop it. Reserve about 4 tablespoons of fat in the skillet (augment with a glug from your backup supply if necessary). Add the sliced scallions to the pan and cook for a minute. Pour in the cider vinegar, sugar and a pinch of salt. Stir well and boil lightly for a minute. If you’re using cheese or toasted nuts, distribute them over the greens. Pour the hot dressing over the top, toss well and sprinkle with the bits of cooked bacon and plenty of fresh pepper. Serve warm. It’s Camp Bacon week! In honor of the book that started it all, here’s an excerpt from our collection of recipes. Interestingly, as we were working to transform Francois’ notes into culinary reality, the woman who was doing our testing—Jean Henry—shared her own experience out of the German tradition here in the U.S., bringing the bacon story full circle. “I grew up with a Pennsylvania Dutch version of this salad,” she emailed the same evening she saw Francois’ version. Fry the pancetta over medium heat until crisp. While the pancetta is cooking wash the greens, then spin or pat them very dry. Place them in a warm, but not hot, serving bowl. When the pancetta is done, immediately pour it and all its drippings straight from the skillet over the greens. If you need more fat, you can add a bit of olive oil. Toss immediately so that the hot fat wilts the greens a bit. Spoon the mustard onto the greens, then sprinkle on the vinegar, then toss again. Add salt and pepper to taste, toss one more time and serve right away. Substitute an American smoked bacon for the pancetta—Jean Henry recommends the Arkansas peppered bacon. For the dressing, whisk together all of the ingredients: 2 teaspoons of a sweet, smooth German-style mustard, 1 egg, a teaspoon or so of sugar, 3 tablespoons of good apple cider vinegar, about 2 teaspoons of the bacon fat, and salt and pepper. Pour the dressing over the dandelion greens immediately. Serve Up a Bacon Board at Your House! Zingerman’s 5th Annual Camp Bacon is coming up! In honor of the fun, how about cooking up a Bacon Board? Here’s a way to make bacon eating as educational as it is enjoyable! The way we see it, if everything is better with bacon, we could make everything four or five times better by serving four or five different bacons every time we entertain. If you’re having company for brunch why not buy a range of different bacons and let your guests experience their respective flavors—tasting one bacon next to another is incredibly interesting and delicious. Even for lunch, why not cook up a couple different bacons—let your kids sample and compare. It’s a great way to practice adjectives (“What do you think each bacon tastes like?”), geography (“Where does this bacon come from?”), etc. It works for cheese, right? We’re all used to serving four or five cheeses on a cheese board so that our guests can taste, compare and enjoy the diversity of flavors and textures. Why not take the same tack for bacon? In honor of Camp Bacon, we’re sharing an excerpt from A Pocket Book of Bacon that comes to you with one of your yummy shipments of the Bacon Club from Zingerman’s Mail Order. We’ll also have a few of these books on hand at the Street Fair. Enjoy! Different method, different texture, different flavor. We recommend trying ’em all and choosing your favorite for the recipe at hand. Note that if you need drippings for your recipe, you’ll want to cook your bacon in the skillet or oven. The key here is to start with a cold skillet. We like to use a well-seasoned cast iron pan, though a non-stick pan works well too. Place the pieces of bacon side-by-side in the skillet, and turn the heat to medium. When the bacon starts to brown, check to see if it releases easily and carefully turn it using tongs. Cook on the second side until it’s done to your liking. Note that some bacons, like Irish back bacon, will cook much faster than others. Remove and drain on paper towels. Preheat the oven to 375°F. Cover a large baking sheet (one with a 1/2- to 3/4-inch lip to catch the grease) with parchment paper or foil. Place the raw bacon side-by-side on the parchment paper. Bake for 15 to 20 minutes until bacon is done to your liking. Remove bacon to paper towel-lined plates and pat dry. There are many tools out there to help you with your microwaved-bacon skills—many available on infomercials on late night television. We’ve chosen the good ol’ plate-and-paper-towel method here, which works great for a few slices. In this procedure, you will not get any usable drippings. Line a microwave-safe plate with several layers of paper towel. Lay up to 6 slices of bacon across the towels. Cover the bacon with a few more layers of paper towel. Microwave on high for 4 minutes. (Cooking time will vary according to the microwave and number of slices of bacon you have.) Remove the bacon from the paper towels and serve. You can cook your bacon in an iron skillet over the fire just like on the stove at home. If you’re feeling a wee bit more adventurous, you can also cook it on a stick. The risks of losing a slice of bacon to the fire are about equal to that of roasting marshmallows over an open fire, so if you get emotional over lost bacon you might not want to try it. The perfect time to roast is when you’ve got a nice layer of hot coals going and the fire is not too high. Fold a slice into thirds and skewer it on a long stick. Roast it until it’s cooked to your liking. Next time you cook a batch of bacon, let the grease cool until it’s safe enough to pour through a fine sieve lined with cheesecloth into a glass canning jar. Make sure to filter out the small bits of meat that could cause the fat to go rancid. Keep it around for those times when you want to add more flavor to your dish than you’d get from a spoon of butter or olive oil. How should you store it? Folks have been resting jars of bacon fat next to their stoves for centuries without much incident so you can certainly go that route. For safety’s sake, we generally recommend storing it in your fridge where it can last months. John T. Edge, writer, culinary historian, and cultural commentator par excellence grew up in Georgia where his mother always kept a Dundee jam jar filled with bacon grease next to the stove: “She started every dish with a glug of bacon fat.” Sounds like heaven. Wrap a dried date (or one of your favorite dried fruits) and a piece of cheese with a half-slice of bacon. Run a toothpick through it and bake it in the oven. Try an Ojibway tradition and top your oatmeal with a few chopped slices of cooked bacon. A tip we learned from the Romans: drop a raw slice of bacon rind into your pasta water to enhance the flavor of your pasta. For 42 more ways to put bacon to work in your kitchen, see Zingerman’s Guide to Better Bacon or email us for more ideas at zingpress (at) zingermans (dot) com. We’re headed to the 3rd Annual Pastoral Artisan Producer Festival on the 27th of April. Make your travel plans now–there will be plenty of great food to taste. This a FREE tasting and meet-the-maker event featuring producers of artisan cheese, bread, beer, wine, charcuterie, confections, and other food stuffs. John and Aubrey from Zingerman’s Creamery will be there with a wonderful array of cheeses, alongside some of our favorite artisan producers. Right there with them, Ari will be talking about bacon and books! Among our hand-picked books that will be available, he’ll have The Story of Traditional Wisconsin Cheese on hand. Stop by, say hi, and treat yourself to a yummy book-buying experience.